The following is one of a few posts live from the American Association for the Advancement of Science Meeting held in San Diego, February 18-22, 2010. To my left was the ocean – dark and deep. It called to me, a mysterious enigma, with treasures and puzzles of flora, fauna and rock that still remain to be discovered and solved by who knows who. To my right, was the San Diego Convention Center, site of the American Association for the Advancement of Science’s (AAAS) annual meeting. The structure was stuffed to the gills with scientists. Screw the sea, Jack. It’s the triple A-S that had my eye. I know I shouldn’t malign the marine environment like that. 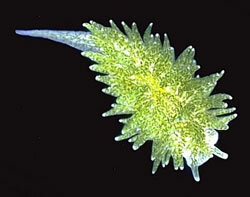 What did a Sacoglossan sea slug ever do to me? And after all, there’s plenty of science in the sea. But there’s no denying the energy that was in the air when thousands of scientists and science-loving comrades from as many as 50 countries gather in one place – it’s pure magic. And yet there’s nothing magicical about science itself. In his opening night address, AAAS President Peter Agre, 2003 Nobel Laureate in Chemistry, stated that “Science is different from magic because it has a natural explanation.” Indubitably. There’s tons of fantastic scientific research that was featured at the meeting. Highlights included ground-breaking research findings associated with non-vaccine strategies for eradicating HIV, impacts of childhood poverty, lessons in human health obtained from dolphins with diabetes, green plug-in cars that power the grid, and oh yes, saving marine creatures and habitats. On the physics front, there was a whole day devoted to the 50th anniversary of the laser (see http://www.laserfest.org/) – more on that to come soon. There were also talks on physics and art, the arrow of time, traffic, crowds and society, exobiology, neutrinos, the media’s take on that whole LHC vs. the end of the world thing, and how basic physics benefits society. And there was also the opportunity to meet University of Minnesota Physics Professor and Science Consultant to Watchman, Jim Kakalios, who discussed the physics of superheroes. Incidentally, just last week, it was announced that a group of UC Boulder scientists have created the hottest temperature on Earth, and for that matter ever measured in the universe: 7.2 trillion degrees Fahrenheit. Using the Relativistic Heavy Ion Collider, or RHIC, at Brookhaven, the team smashed charged gold particles into each other and created quark-gluon plasma. In doing so, Physics Professors Jamie Nagle and Edward Kinney essentially recreated the conditions of the universe only a few microseconds after the Big Bang. Doomsday scenario, anyone? But back to the meeting. As if the dolphins, nanotechnology and physics of art were not enough, in the same convention center at the very same time was the Pro Tour of Magic: The Gathering. It was hard to contain my excitement, and my hands quivered as I typed this, but I would lie to no man about such a serious subject. In what could be construed as a cosmic packing problem – just how many nerds can be bundled into a given space? – this World championship of Magic was happening literally down the hall from the science conference. I had the good fortune of running into a Magic star in the center. Jan Reuss, who was flown in from Germany by the company that runs the Pro Tour, told me that he was one of about 400 Magic Olympians playing in this invitation-only affair, competing for a $40K grand prize, with a total of $250K to be awarded. I found him sitting on the floor playing a practice round with his buddy, and he was gracious enough to speak with me despite the fact that I interrupted his game. According to Reuss, he took 2nd place at the Pro Tour in 2008. Despite a plethora of Magic Wikipedia sites, I was unable to confirm this fact. By the way, don’t ask me to explain how Magic works. I can’t. It bedevils me. I’d much rather discuss quark-gluon plasma and the dawn of the universe. Jan took second place at Pro Tour Hollywood in 2008. He was also being humble if he didn't mention that he made the top eight in Pro Tour Kyoto at the beginning of 2009. How Much Snow did Washington DC REALLY Get? "Going Boldly Where No Hat Has Gone Before..."
Is the Ozone Keeping Out Cosmic Rays? I love a baseball post!